Jeff’s folks live outside of Chicago, and on our last little jaunt out they suggested we get lunch at a place called All Chocolate Kitchen in the small town of Geneva. “Wait a minute,” I said. “You’re telling me there’s a place nearby called All Chocolate Kitchen that I’ve never been told about in all my previous trips out to visit?” Apparently it’s new, or so they said. Um, YES we were going there! The restaurant is owned by Chef Alain Roby — you may have seen him on one of the food networks. The man is a mastermind of desserts, and he likes to do things on a grand scale. The restaurant itself is not large or ostentatious. It’s set up like a little Parisian cafe or bistro. There are tables and chairs, a few couches, lovely lighting, and lots of windows. The decadent displays and life sized chocolate sculptures, though, are something else. 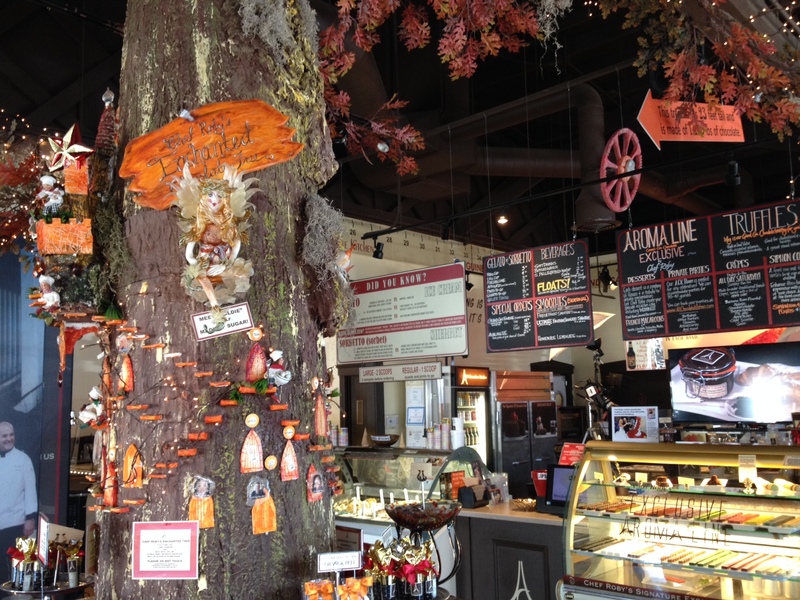 Yes, this tree is entirely made of chocolate! As you walk in the door, you can’t miss the giant tree sculpture with a counter encircling its three-foot diameter trunk — entirely made of candy! The main tree — which does look quite real — is made of chocolate, of course, and decorated with blown sugar figurines. The counter is made of hard candy. 1200 pounds of milk, dark and white chocolate were used to make the 23 foot tree (please do not touch or bite!). In other parts of the restaurant there are small blown sugar sculptures and pieces of hanging art made of both blown sugar and chocolate, and there are several life sized chocolate sculptures as well. There’s an astronaut, a Chicago Blackhawks hockey player, a jazz musician, and a sculpture of Eros. Video monitors display the creation of some of the sculptures. And then there are the displays of the chocolates you can actually eat but which also look like art. 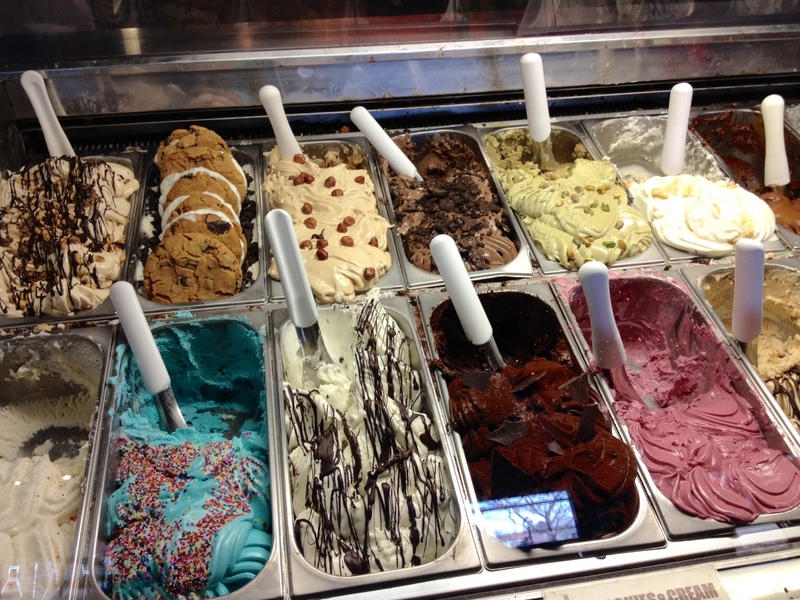 There is a case of more than a dozen flavors of gelato. There’s a case with traditional truffles and larger sized treats, including sea salt toffee bark and chocolate covered bacon! There’s a case with cakes, pies, brownies, and other baked deliciousness. And there’s a case of gorgeous fancy truffles that look almost like they’re wrapped in a fine cellophane, they’re so shiny. There are also pre-packaged treats like chocolate covered nuts, pretzels, orange rind, and malted milk balls, and plain old giant chocolate bars, too. It was almost too much to take in, and certainly difficult to choose. Before we dove into the chocolate, we did eat actual food — soup and potato pizza (they also serve quiche), but that was really just to make it look like we weren’t there for only one thing. After lunch, Jeff went straight for the gelato, as that’s a favorite of his. In what should be a criminal violation, however, he didn’t have a flavor with chocolate! His dad also had gelato, but at least he had the stracciatella, with a some chocolate flecks. His mom chose a key lime pie that looked delicious, wrapped in a chocolate crumb crust. I finally chose the flourless chocolate cake topped with raspberries and raspberry sauce, and it was the best I’ve ever had. It was so rich and dense I could only eat half of it at lunch. After dinner that night I finished my cake and Jeff ate the specialty truffle he’d purchased — a white chocolate Thai basil coconut flavor. It sounds strange, but it tasted divine. The basil was very mild and melded perfectly with the other flavors. Chef Roby knows his stuff! I’m actually a little bit glad that the restaurant is a half hour away from his parents’ house or I’d be making way too many visits there on our future trips. 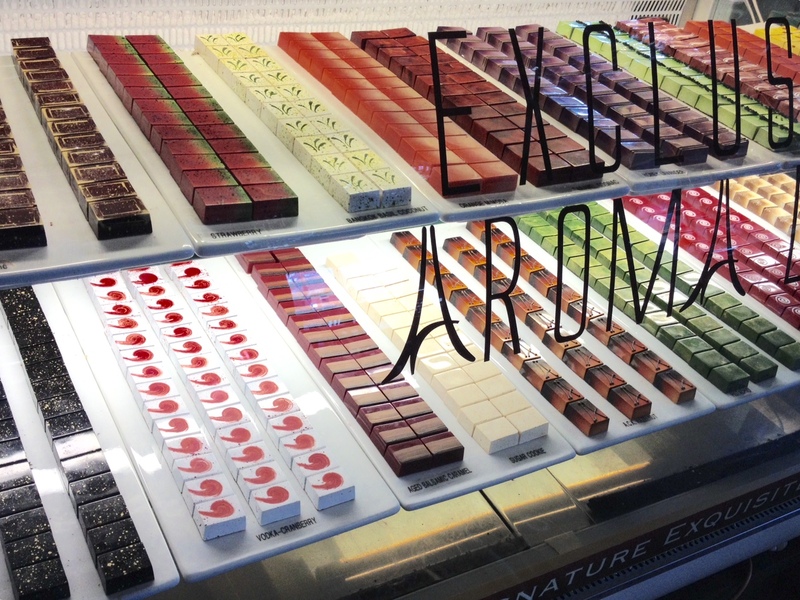 If you’re a chocolate fan headed to the Chicagoland area for a week or a weekend, I definitely recommend a trip out to Geneva. You won’t be disappointed! Chocolate, salt, and fat are where it’s at!